From 1 September 2012, anyone who keeps livestock in NSW will be required to obtain a PIC for the land on which the livestock are kept. The expanded requirements also include deer, bison, buffalo, camelids, equines (i.e., horses and donkeys), 100 or more poultry birds or 10 or more emus or ostriches. 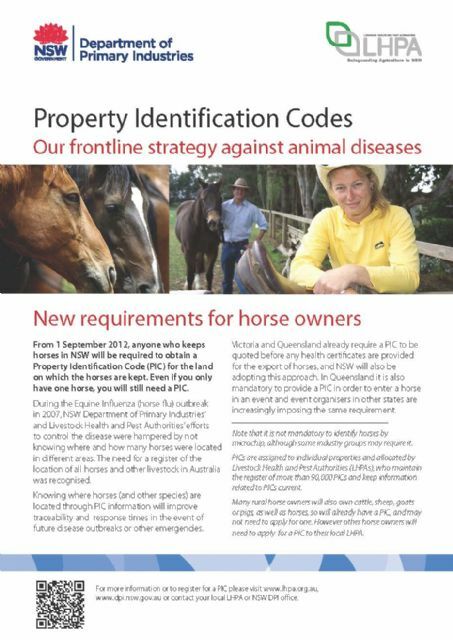 A property identification code or PIC is a unique identifier for land used for keeping livestock. PICs are assigned to individual properties and allocated by Livestock Health and Pest Authorities (LHPA).